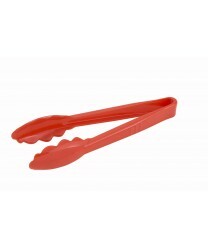 The plastic, durable Winco PUT-9R Polycarbonate Utility Tong, Red 9" is a must have serving utensil for your food establishment when you want to ensure sanitary and hygienic food service for your guests. These plastic tongs, with a scalloped edge design, provides a firm grip on food so you can use it for a variety of serving and cooking functions such as mixing pasta with sauce, removing hot items from a boiling pot, or placing salad toppings on a salad. Highly functional and boasting a comfortable design, these red serving tongs will have many uses in your commercial kitchen.